The WHO had previously predicted that polio could be eradicated by the end of this year. Unable to vaccinate in the region, the WHO tried to prevent polio spreading further by protecting people in neighbouring countries. However, Guinea and Mali were outside the ring of countries targeted by WHO and the United Nations Children's fund (UNICEF) in an immunisation campaign launched in February. Ten African countries, which had previously eradicated the virus, have now reported new cases. Bruce Aylward, co-ordinator of the Global Polio Eradication Initiative, said the latest cases suggested efforts to contain the virus were not working. "This is an extremely important development," he said. "Earlier this year, we had conducted a synchronised campaign in a group of countries around Nigeria and Niger. "What we are seeing is the virus actually breaking beyond that into a second tier of countries - so very big implications." The WHO is worried that a major polio outbreak could be around the corner. The high season for polio transmission begins in September. 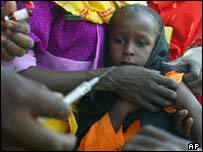 Officials have drawn up plans to mount three vaccination campaigns in 22 African countries, over the next 12 months. It's aimed at halting the present outbreak, and banishing polio from the continent forever. But as yet there aren't enough funds to carry it out - US$50m is needed by the end of this year alone. There are also questions over whether people will accept the vaccination teams. Kano leaders recently changed their stance and a four-day campaign took place. However, it is estimated that only 60% of children were brought forward, which is not enough to stem the virus. Polio is a highly infectious disease caused by a virus, which invades the nervous system. It can cause total paralysis in a matter of hours. The disease can strike at any age but mainly affects children under three years of age. "There was a great concern that this would spread"